There is a soon to be released film adaptation of Popular Sci-Fi novel series “John Carter”. Directed by Andrew Stanton, it will be Pixar’s first foray into live action and features an American Civil War veteren named John Carter (Taylor Kitch) who gets transported to Mars, where he discovers a lush planet inhabited by 12-foot tall barbarians. Unfortunately He then gets taken prisoner by the locals, but eventually he manages to escape, only to encounter a princess named Dejah Thoris of Helium who is in desperate need of a savior. He then discovers that the various nations of the planet, whose leaders include Tars Tarkas (Willem Dafoe) and Princess Dejah Thoris (Lynn Collins), are at war with each other and he gets involved in the conflict and takes it upon himself to save Barsoom (Mars) and its inhabitants. 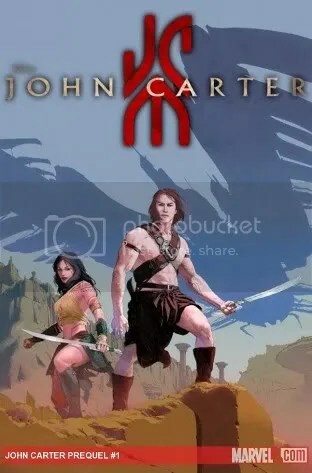 Originally created by Edgar Rice Burroughs, John Carter is a fictional character, who appears in the Barsoom series of novels. Though actually a Virginian from Earth and a visitor to Mars, he is often referred to as “John Carter of Mars” in reference to the general setting in which his deeds are recorded, in the time-honored tradition of other real world heroes such as Lawrence of Arabia and Scipio Africanus, The character is an enduring one and has appeared in various media following his 1912 serialized debut. In the forthcoming 2012 film adaptation of the series, John Carter is played by Taylor Kitsch, with the role of Dejah Thoris to be played by Lynn Collins. The film also stars Dominic West, Ciaran Hinds, James Purefoy, Mark Strong and Samantha Morton. The film is being distributed by Walt Disney Pictures and is being released in the United States on March 9, 2012. So far I’ve seen a few trailers and it looks very exciting. Graham Coxon, 42, said: ” it’s always nice to get a Brit Award. The band’s last win was in 1995 when they collected four trophies on the back of their hugely successful third album Parklife.